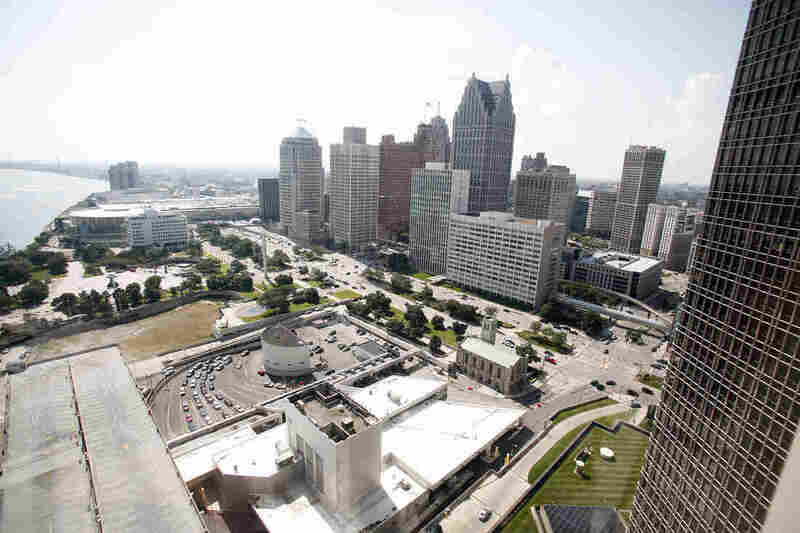 Now That Detroit's Filed For Bankruptcy, What Happens Next? : The Two-Way The lights will remain on and city services should continue, says Michigan Gov. Rick Snyder. But the filing sets in motion what could be a years-long process to resolve the bankruptcy case. A portion of downtown Detroit along the Detroit river. With its bankruptcy filing Thursday, Detroit became the largest municipality in the United States to seek Chapter 9 protection. As Scott reported, the city is saddled with $18.5 billion in debt. Today, we ask, what happens next? -- CNN reports that Michigan Gov. Rick Snyder said today "should be a regular day." The lights won't be turned off, and city services should continue. Snyder said that, perhaps ironically, future city services may improve because the city is no longer burdened with what he called "legacy costs." "I know many will see this as a low point in the city's history," he told CNN. "If anything, this gets us on the path towards improved services." -- As for what happens on the legal side: The Associated Press says because Detroit is such a massive bankruptcy, the case "could take years to resolve." "... city assets could be liquidated to satisfy demands for payment. The city would propose a reorganization plan. The wide-ranging plan could include anything from selling assets, layoffs, changing union contracts and more. Then, the city would need the support of creditors to emerge from bankruptcy." The Wall Street Journal reports that perhaps the hardest hit in all of this may be "unsecured creditors." That includes people who were expecting a pension from the city who will "likely get just pennies on the dollar." The Journal adds that federal bankruptcy code doesn't require a city to liquidate assets. That said, Detroit could decide to sell some of what it owes to pay creditors. One big concern for art lovers: the Detroit Institute of Arts, which is owned entirely by the city. Graham Beal, the director of the museum, told CNN Money that the city's emergency manager, Kevyn Orr, asked the museum for an inventory. Beal said the collection — which is world class and includes works by Matisse, Van Gogh and Rembrandt — "is not off the table." The museum issued a statement last night to WXTZ-TV saying it will defend its collection. "We remain committed to our position that the Detroit Institute of Arts and the City of Detroit hold the DIA's collection in trust for the public and we stand by our charge to preserve and protect the cultural heritage of all Michigan residents," the museum said.